Set of original 1920’s French twin single armchairs in Wedgewood blue and cream jacquard floral fabric. (Think Wedgewood is English, sorry but it is similar colour). Curved timber sides and legs with Queen Anne style legs and padded sides with cosy top and bottom feather cushions in matching fabric with piped trimming. Very sturdy, comfortable and excellent quality. There are some characteristic marks on each piece which add to its natural integrity and beauty. The timber work is impeccable and beautiful! These chairs would make great bedroom chairs or suit lounge, sunroom or enclosed verandah. Each chair is beautifully constructed and has been made by traditional French craftsman and has years of wear and tear left for some special person to enjoy. Each chair is $1,200 each pus delivery. Great value as contemporary replicas would be dearer and no wear as good, beautiful or as durable. 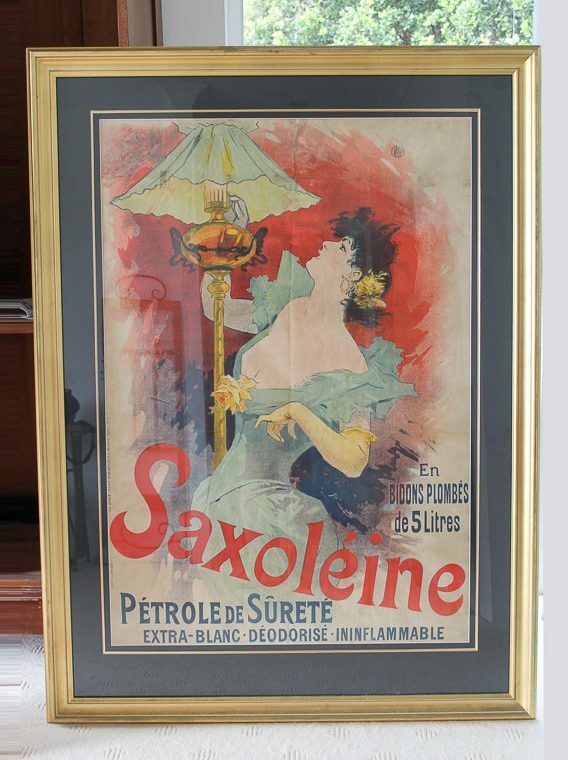 This chair aptly matches other French products we have such as an original Jewels Cheret Poster, French Lamps. Prints, and more. Jewels Cheret poster featured in this post until chair image available. Beautiful statement piece, just love it!